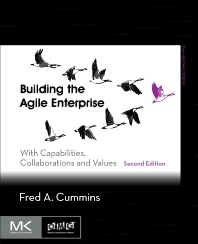 Building the Agile Enterprise with Capabilities, Collaborations and Values, Second Edition is a must have reference for business leaders, CTOs; business architects, information systems architects and business process modeling professionals who wish to close the gap between strategic planning and business operations as well as the gap between business and IT and enhance the creation and delivery of business value. "From the title it would appear that this tome is just another take on agile software development, but neither this edition nor its predecessor is purely about software; rather, Cummins focuses on how to build an organization that takes on challenges and reorganizes in the face of environmental, customer and market changes. The old saw comes to mind: a politician is asked how he could have changed his mind, flip-flopped on an important issue. The response: 'I change my mind when the facts change, what do you do?' Unfortunately too many organizations fail to take note nor advantage of situational change and miss opportunities to grow or even survive. A key idea, for both technical people and organizational leaders, is understanding how to model the enterprise and take advantage of models in real-time. Cummins gives far more than an overview on how to survive and flourish, in an agile way, in a changing world. No organizational leader should ignore the opportunity to succeed using his approach." – Richard Mark Soley, Chairman and Chief Executive Officer, Object Management Group, Inc.
Fred Cummins , is currently an independent consultant and business systems architect. He is an active member of the Object Management Group as co-chair of the Business Modeling and Integration Task Force, co-chair of the Business Architecture Special Interest Group and co-chair of the Value Delivery Modeling Language Finalization Task Force. He was a leader in the development of the VDML (Value Delivery Modeling Language) and the CMMN (Case Management Model and Notation) specifications. He is a member of the board of LEADing Practice that is the provider of reference enterprise standards based on industry research by the Global University Alliance. Mr. Cummins has authored three books and a number of professional papers, and is inventor on 14 US patents. He was previously a Fellow with EDS and Hewlett Packard. He has consulted and developed systems in multiple industries including manufacturing, financial services, healthcare, transportation, telecommunications, insurance and government. Throughout his career he has applied advanced systems technology.